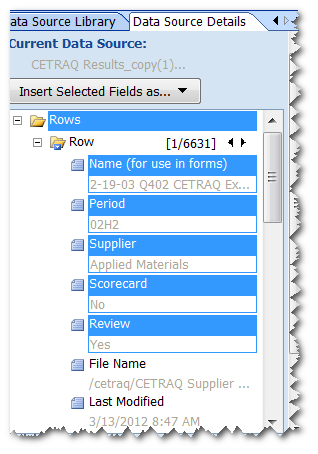 Deleting List or Library Fields Breaks Data View Web Part in SharePoint 2007 | Are you a user? Okay, I know this is OLD 2007, but some folks are still running it! This is actually a two-part fix. Here’s the web part that is showing an error because field(s) were deleted from the underlying list (library). 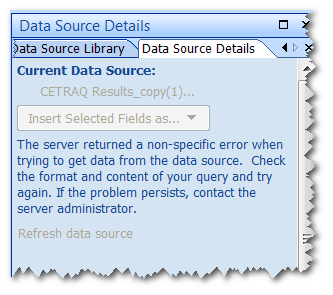 The data source will not return any data because it is also messed up due to the deleted list fields. You can find the datasource in the _fpdatasources folder. Then you can edit it in XML or Text mode. You probably need to check it out first, or you won’t be able to save it! Fix the data source. 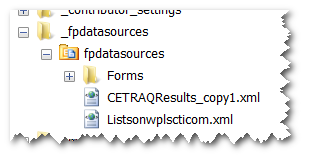 This involves finding the field in the data source XML that has been deleted. In this example, we have found <FieldRef Name="Scorecard"> that has been encoded (e.g. &lt;). Delete it, and be sure you get all the correct text deleted. Now you can see the data in the data source once again! You need to fix the web part by finding the extra field(s) that are being referenced and remove them from the data source reference. In the code view, find the <DataSources> tag and you can then locate the <datafields> section where the deleted list fields are still present. You need to remove them as shown above.